Gene Siskel: Compared to other films for young children, "Willy Wonka" rates barely acceptable. Adults will receive more entertainment by dropping their children off at the theater and driving around the block. Roger Ebert: “Willy Wonka and the Chocolate Factory” is probably the best film of its sort since "The Wizard of Oz." It is everything that family movies usually claim to be, but aren't: Delightful, funny, scary, exciting, and, most of all, a genuine work of imagination. “Willy Wonka” is such a surely and wonderfully spun fantasy that it works on all kinds of minds, and it is fascinating because, like all classic fantasy, it is fascinated with itself. AV Club: For all its slightly forced appeals to childhood whimsy and the freedom of "a world of pure imagination," the 1971 musical film adaptation of Roald Dahl's classic Charlie And The Chocolate Factory was originally planned as a down-to-earth commercial stunt. Quaker Oats financed the film to promote the Wonka Bar, a new candy-bar concept that never got off the ground. That may explain why Willy Wonka & The Chocolate Factory (Quaker insisted on the name change in order to give its product more prominence, according to a featurette on the film's new 30th-anniversary DVD release) sometimes feels like a program-length advertorial—not for chocolate, but for an innocence and playful fancy that it claims to respect, but can't quite achieve. Empire: Gene Wilder proves perfectly cast as the weird combination of the avuncular and the eccentric in Willy Wonka, just adding a layer of sinister to his aloof mad-inventor routine. Peter Ostrum’s Charlie is rightly goody-goody but not mawkish, and across the troupe of brats and parental disasters everyone fits the bill of these gross creations. And those orange-skinned slave-imps the Oompa Loompas serve up all Dahl’s witty warnings of the wages of naughtiness as magnificently choreographed tick-tock nursery-songs. All this though pales in the face of Harper Goff’s art direction. With the exteriors filmed in a fairy-tale Germany, the factory is a childhood fantasy turned madhouse, a trippy, sensuous micro-world that mixes temptation with moral burden that each winner will learn to their peril. Imagine room upon room where everything is edible, where rivers runs with chocolate milk, secret formulas are concocted for everlasting gobstoppers and golden geese lay chocolate eggs, all Dahl’s genius is recreated in a primary coloured sheen like a giant sweet shop conjured up on LSD. The life lessons could be construed as trite, but with Anthony Newly and Leslie Bricusse’s chirpy songs and the dark stabs of humour, even teasing feints of child torture, it never drifts too far into the sentimental. Den of Geek: The jewel in the crown, though, better than the Oompa Loompas, the non-nauseating cast of child actors and the strong production design, is Gene Wilder. This is as uneasy a central performance in a so-called children's movie as we can remember. Are we supposed to like him? To be scared by him? Is he on the side of the children? Is he a prelude to the Saw series? For the vast bulk of the running time, you simply don't know. And in Wilder's hands, Willy Wonka becomes an immense screen presence. It's surely one of the man's best three performances, and those aren't words written lightly. With more and more children's films taking such a softly-softly approach to entertaining kids, Willy Wonka And The Chocolate Factory is destined to live on for a lot longer yet as a classic of the genre. It appreciates that children have brains, it throws in lots for the adults, and it might even have you checking out the price of the soundtrack album on Amazon. Most staggeringly of all, decades on it's still just as strong as it always was. Slant: The film is a mess of loud, contrasting colors. Dahl’s successful stories are sweet and sour, because you sense him buying into sentimental impulses despite himself; this Willy Wonka, with no mood or visual sense to speak of, inadvertently becomes a poor boy’s journey into hell to watch as its ringmaster dispatches a variety of monsters, while the race he’s enslaved to produce his sweets occasionally looks on. The description pulled from IMDB in this case is among the weirdest yet, as if it was passed back and forth through Google Translate a few times. I wondered why movie Charlie and Grandpa Joe misbehaved in the factory. at least 2 of the kids die(not sure about Augustus). Did this happen in the West End version too? I had the original edition in which the oompa-loompas were black, my 5th grade teacher read us the version in which they were blond and blue eyed, in Dahl's final version their race wasn't specified. My daughter loves this. I find it vaguely dull, except that after listening to the audiobook with her she asked why they had to leave out so much and now wants a 20-hour mini series. With cabbage soup. The book is grimmer like all Dahl but Wilder is the only one who seems to have read the source material. I found Charlie's indifference to the other children's deaths chilling as an adult. Oh man, sorry to derail about the musical, but I have been wondering about how much dying goes on. I've only been able to listen to the soundtrack, which I quite liked, but it's unclear to me how much flat-out murder goes on (in the American version, anyway). No one's revival is mentioned in song. Only growing up made me realize how petty the kids' infractions were. Violet likes gum too much! Augustus has Prader-Willi syndrome! Mike likes TV! And Veruca just needed a good time-out or ten. No injustice was obvious to me as a child, of course. There's nothing a kid likes more than seeing another, nastier kid get in trouble. Julie Dawn Cole (aka Veruca Salt) also published a memoir a few years back called I Want It Now! 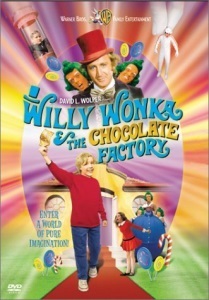 : A Memoir of Life on the Set of Willy Wonka and the Chocolate Factory. I haven't read that one yet though. The official Dahl site published excerpts from Dahl's first draft showing some of the idea that were ultimately excised from the book. Worth noting that in the original book, nobody died. Charlie sees all the other kids and their parents leaving the factory when they're flying around in the Elevator at the end of the book. Augustus is tall and skinny from the pipe; Violet is back to the right size but permanently violet; Veruca is covered in garbage; and Mike is tall and skinny from being overstretched. If anybody wants to see the original black pygmy Oompa-Loompas that brujita mentions, I've got a scan on my site. One of the first films that I remember seeing in the theater. The Jersey Theater to be exact and without adults, just me and my friend Johnny at the age of seven going to the movies. I liked the movie at the time but I had already read the book and I remember annoying my buddy by telling all the things that were different. Augustus is tall and skinny from the pipe; Violet is back to the right size but permanently violet; Veruca is covered in garbage; and Mike is tall and skinny from being overstretched. I remember reading this version. Veruca (arguably the most annoying kid) gets off quite easy - she can just have a bath. Kid-me found this highly unfair. Why does everyone want dead kids in their adaptations? oh boy do i love this movie. i haven't ever been able to bring myself to check out the false Wonkas out there. I saw it presumably on release at the still-open Coolidge Corner cinemas in Brookline, Boston. I was definitely too young and the dissappeared kids and psychedelic tunnel sequence left a mark. Reading the book(s) (fuxake this has to be a books-too thread) a few years later was also fantastic, although I recall puzzlement about how the book illos did not match the film. I associate this film directly with Chitty-Chitty Bang-Bang (candy factory, musical, malevolent man in a top hat offering candy to children) and Dr. Doolittle (ANTHONY NEWLY). I played Willy Wonka in a community theater version some years ago, and my favorite story from that production hinges on the knowledge that I am a wheelchair user (spina bifida). A friend of mine was in the theater's concession area during the intermission of one of the performances. She heard someone (who was undoubtedly thinking of Gene Wilder's entrance in the film) say, "I'm just waiting for Willy to get out of the wheelchair in Act II." "I wouldn't hold my breath," my friend replied. AV Club: For a children's film, Willy Wonka is surprisingly malevolent, which is most of its fun. Have they read Dahl? He's malevolent when he's not whimsical, and can mix the two, which is much of his fun. Why SNOWPIERCER is a sequel to WILLY WONKA AND THE CHOCOLATE FACTORY (links to fanfare thread, spoilers in main link).